Most young boys (and some young girls too) dream of growing up to be a basketball superstar! However, it’s not all game and glamor! Too often people think that being a proficient basketball player all relies solely on them sinking baskets and being flashy with their moves. The truth is however that effective ball handling and speed and quickness training are essential for someone to become a basketball superstar. Keep reading to find out why ball handling is critical to your (good) basketball game and which drills will improve your handling on the court. Many people think that effective ball handling and learning quick and crafty hand / ball tricks are the key to everything. 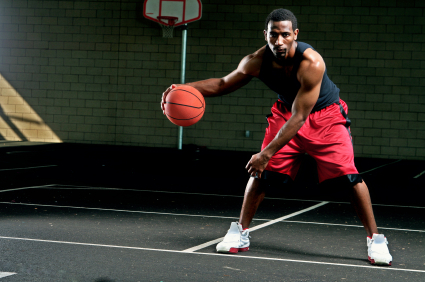 Your body strength and physicality plays a big part in becoming a strong basketball player. You need to assure that you have strong posture when training to be a good basketball player. Your posture and strength of the body will determine how you play. A strong stand will help you catch and pass the ball with power, whether in short or long distances. Remember that your body assists and aides your game. Make sure to practice defense techniques to protect your basketball. This is a transitional talent between effective ball handling and speed and quickness training. If you can combine handling speed, ball control, and blocking defenses, then you can learn many “ball circulation” techniques, including dribbling the ball behind your back, around your head, and various passing transformations. This will assist you in learning to “fake” out your opponent and effectively navigate the basketball to where you’d like it to be. It’s not enough just to dribble or perform a crossover move. It truly is all about your speed in ball handling! Practice improving your dribbling by performing drills. In a gym, dribble the basketball while running back and forth. This will help you in many ways. First it will help improve your dribbling skills and ball control. Also, it will help you determine your running strength. The more you run, the more proficient you become at it. The more you dribble while running, the more your body will learn that automatic movement, which will make control of the ball easier while you are running and dribbling faster than all of your opponents! Ultimately, it is essential to realize that effective ball handling is critical to your game. Even if you are the fastest runner and most sly player on the court, if you are not effective in keeping control of the basketball, not only for yourself but against your opponents, then all the speed in the world will not help you be an effective player. If you find you are having trouble perfecting your skills, then see assistance. There are many programs, lessons, and drills out there that can assist you in mastering your craft. Anytime someone is training to perform in a sport, they are ultimately training to be the best! You can have all the attributes you like, but the two most important things to have have when training to have effective ball handling is: 1) effective ball handling skills and 2) speed and quickness training. This technique is pretty easy. All you have to do is the hold the ball out in front of you and begin passing the ball from hand to hand. The trick is that you can only use your fingertips. I know it can seem a little odd, but this will help you in the long wrong. Start from above your head and then to the tops of your shoes and back. This allows you to develop KILLER fingertip control which helps you to better control the ball. Alex recommends you do this for around 30 to 40 seconds. Okay…this doesn’t mean you go out and slap someone. This is a good one for warm ups. You need to hold the ball in alternating hands and then start to slap the ball over and over. What does this do? Well…it helps you to get a better feel for the basketball and also warms your hands up. I know, crazy name right? Okay here is how you do this ball handling exercise. Stand with both of your legs together. Once you do this you need to start circling the basketball around your head. After you do your head then you should start on your waist and then after the waist start around your legs which should still be closed. Once you have done this you need to come back up and start doing what you just did, but start backwards. So start with your legs, then move up to the waist, then make moves around your head. I recommend to do this for 45 seconds, but Alex says 30 so either way should be fine. You may have done this one before if you played high school basketball like I did. All you have to do is start by spreading your legs. I recommend you make them a little wider then your shoulders width. Once you do this then put the basketball through your legs, around one leg and then do it through the other leg and then repeat it through the other leg. If your doing it correctly it should look like your doing a figure eight. This is one of my personal favorites for effective ball handling. Being able to effectively handle the basketball is very important to becoming a good basketball player. It’s important to work on your handling skills frequently in order to improve your moves and various techniques. The more time you put into practicing, the better you will become, however there is more to becoming a good player than learning the moves. You also need to achieve the speed and agility that is required to beat your opponents. Keep reading for the top four tips to improve the speed of your basketball handling skills. Run side to side! You can improve your speed by practicing the most basic drill. In a gym or on and outside court run back and forth repeatedly, while dribbling the ball with one hand. This will help you body learn the automatic movement of traveling while controlling the ball. Keep the ball low to the ground and slightly bend your knees while in stance. Try this at first with only one hand. Once you get comfortable with this you can try using your alternate hand or even switching hands while dribbling and running. Keep it low! Practice dribbling the basketball low to the ground. For a healthy practice drill for this, try dribbling your ball low to the ground 10 times with your left hand. Then shift the ball to your right hand and dribble 10 times. Keep repeating this back and forth for at least a few minutes. This ball control drill will help you become comfortable with the ball and allow you to increase your speed naturally. Go behind your opponent’s back.. or at least your own. Once you have practiced tip number 2 and are comfortable with it, try mixing things up a bit. Try now moving the ball to the rear side of your body and dribbling the ball behind your back with one hand. When you feel comfortable with this, try alternating hands. This is a tricky move, but always impressive, so keep practicing your speed! Criss cross! Work on perfecting your cross over move. Most players slow down losing their speed and quickness because they do not practice more difficult moves enough! To solve this, perform well rounded drills that will allow you to complete difficult moves with speed and accuracy. One move you want to practice effectively is the crossover. A good drill for this move is to start with your legs waist level apart. Move one leg slightly forward and practice dribbling the ball between your legs from front to back. Catch the ball with one hand while moving your other leg forward. Continue doing this, alternating hands as you alternate each leg stepping forward every time you switch hands. Next Post What is rogaining?